"A Closer Link with Nature"
and learn about some of their qualities and folk uses. magic amulet. Discover the benefits of a water massage under the cascade. most probably in the afternoon, making acquaintance with group and surroundings, finding your spot, etc. Welcome meeting, outline of the workshop. Evening meal in the kitchen, using as much as possible local products,local wine, mineral water and herbs tea. After dinner: sky watch. There seem to be more stars than elsewhere due to altitude, clean air and geography of Portugal. - Break-fast in the garden, or indoors, depending on the weather. - Meet the closest “neighbors”: herbs growing on old walls around the house and along the path through the surrounding forest; collect samples of identified species to dry for later use. 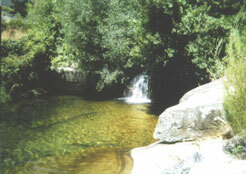 - Stop for a drink by the freshest spring water of the area. - On the way we can “water massage”, under the cascade. - Discussions of top subjects on top of the mountain under the old cedar trees; lunch catered on location, while enjoying a great panoramic view at 1200m of altitude. Along the mountain-crest are several places/hill-tops, each with its herbs and breath taking views and fresh water springs of varied mineral qualities. Back home: care for notes and articles collected. - Out for dinner to the next village for evening regional meal specially prepared for the group by Dona Emília. - 4th day - trip (1 hour drive) to ancient mountain, historic and pre-historic site, power-place where wild lavender, rock rose and other species grow (specially for our herbal pillows) among amazing rock formations. Pic-nic lunch on a magic spot, next to the ancient circular fortress, legendary town of Sortelha (magic ring), and Terreiro das Bruxas (terrace of the witches); the perfect setting to consider the magic use of plants. Back home, dinner at Lusitana´s patio. - 5thday - Walk the ancient road over the small roman bridge to Coentral, rest by the old fountain, continuing with hike along Ribeira do Quelhas towards one source of the river. - 6th day - Home pharmacy: preparation/production of medicinal oils, extracts, and syrups. Discussions: work on notes; With pauses to dive in the river pool, walk under the oaks or just stretch your gaze looking out into the valley. herb cushions/pillows, herbal compresses; smoke healing – smudging, herbal incense, herb bundles - amulets, etc. season conditions of weather and others. 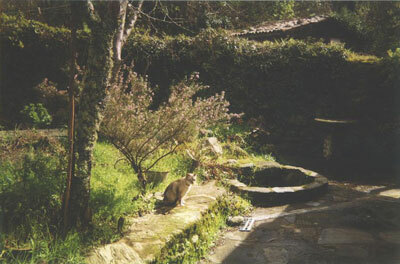 The houses are of old rural architecture with thick stone walls, restored in recent years, simple and functional with a certain comfort, surrounded by nature: all three houses have tab water that comes from pure springs in the surrounding mountains, one of them has a spring in the garden. The rooms have good beds, we share 4 bathrooms two of them with tub bath, the other two with shower. Across the bridge over the river, some meters from the house, starts the forest composed of old oaks and chestnuts but also pines and eucalyptus, creating a quality of air quite unique. Along the river down the valley and up the mountain are several picturesque villages and we have a charming small town at 5 km distance, Castanheira de Pera, with some modern necessities: post office, banks, Internet, shops, café, market, etc. and a spectacular swimming pool with waves, build in the river. In the village, with few inhabitants, at 900m high protected by the mountain, we have a feeling of out of time and out of the world, at least the urban world most of us know: here we are in intimate relation with nature, participating more fully in all its manifestations; the lovely valley carved and fed by our river, lies ahead as we look from the veranda, tapestry of orchards rich in color green; birds, cascading water, constant song of nature on a back ground of silence. At night the amazing clear sky seems closer, the stars brighter, the moon bigger and...no airplanes! No shops either; the baker comes klaxoning every morning with fresh bread, we are assisted by a local lady who helps with shopping, house holding and transport to the more distant locations, and D. Lusitana who will do most of the cooking. 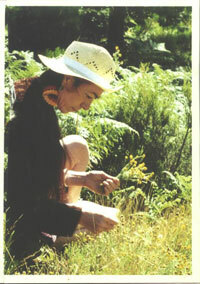 Studying the subtle life of plants and people. The Elementals of plants, the human Elemental. As the name says, Elementals are composed of elements: earth, fire, water, air. Every plant is the manifestation of an Elemental and has its properties. So we have water spirits like nereids, seanynfs, undines, that live in water plants. Sylfs, sylfids, elfs are creatures swaying in the air and living in plants of that element; while the earthy gnomes sit on /live in muchrooms and trees. Alöe Vera is the expression of a fire elemental, salamander ignea. The human Elemental is the combination of elements of an individual, like a blue print that “projects” that individual´s existence. In the process, going from the subtle to the denser untill the physical body is manifested, the individual grows ever more separated from the original blue print. The subtle power of the flower remedies, the vibration of the flowers, can reconnect us with our elemental being, which in essence is healthy and influence us towards health and well being. Elemental therapy is the balancing of health through the elements: if one misses or has in excess certain element (check the horoscope) that can be a sign/source of some imbalance in the physical or mental health; In the therapy of Florais, flower remedies, we take the remedies of the flowers from those elements that we lack. Assessing the Elemental Beeing of the consultant. Finding the match with the flowers´ Elementals. A consult with Florais da Amazónia is also a journy into the primeval forest, it´s variety of trees and plants and their correpondent realms. The first consult takes about one our. The poetical and spiritual approach of Dr. Bach to healing and the Nature. Aromatherapy can treat and prevent diseases because of known studies as to the influence of aroma on the brain. Moreover, the antiseptic, antiviral, anti-fungal, anti-bacterial, and anti-inflammatory properties of oils in the control of infections are also important. Essential oils work in a number of positive ways. They activate the limbic system and emotional centres of the brain. When they’re applied to the skin, they activate receptors and kill microbes and fungi. They are said to stimulate the immune system when applied internally. Essential oils can be used to treat illnesses such as depression, stress, arthritis, back and muscle aches, colds, migraines, asthma, sinus problems, insomnia, skin disorders, and indigestion, among others. Aroma massage covers a wide range of healing effects and is the ideal way of receiving aromatherapy.